Dr. Ravi and his students concentrate on achieving robustness at the signal, feature and classifier level which is extremely significant when the training and testing conditions are mismatched. At the signal level, a wavelet based pitch detection scheme is used to derive an adaptive speech enhancement filter to mitigate noise. Robust features that show little cariation due to noise and channel effects are being configured. Various classifiers and fusion strategies are used to render a reliable decision. Blind SNR estimation of the speech signal to be analyzed is used in deriving a confidence metric for the speaker recognition task. Dr. Shreekanth Mandayam collaborating with his colleagues at Fox Chase Cancer Center is working on developing new image analysis techniques for radiodense tissue estimation from digital mammograms. Also, with a grant from National Science Foundation, he and his Civil Engineering colleague Dr. Sukumaran, along with a team of ECE students are developing 3-D image recognition and analysis techniquesfor identifying different types of sand particles. 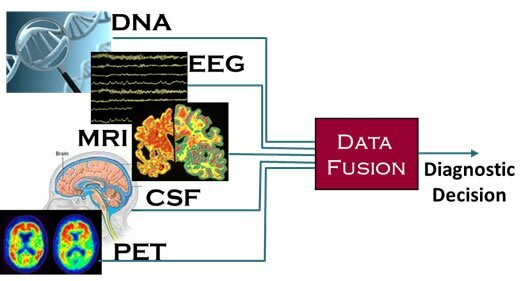 Dr. Robi Polikar and his students, along with his colleagues at University of Pennsylvania and Drexel are studying various signal processing and automated classification techniques for early diagnosis of Alzheimer's disease from electroencephalogram recordings. Their work is funded by the National Institutes of Health and is being conducted at Rowan’s Signal Processing and Pattern Recognition Lab. One of the newer areas of active exploration at SPPRL is the so-called brain-machine interface (BCI). No, it is not mind reading – but not too far off either. A BCI system allows an individual (or an animal, such as a monkey) to control a physical device or a software system through his/her thoughts only, without using any motor control. 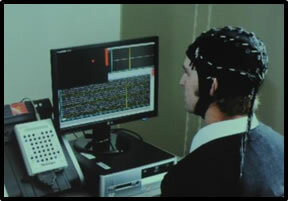 This is done by acquiring and analyzing brain-waves – called electroencephalogram (EEG). It is possible to control a device, say a joystick, or a cursor on a monitor, or even type on a virtual keyboard without using a single motor muscle. Dr. Polikar and his students at SPPRL are investigating various novel applications of BCI as well as EEG based memory test.